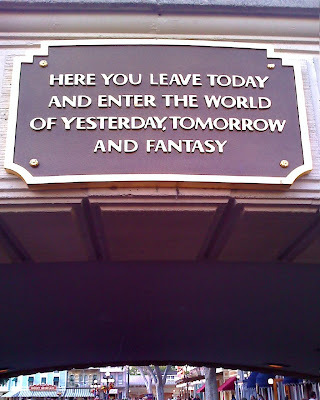 Going into Disneyland you see this quote from Walt Disney Ready for another fun filled Zippidy Do Dah Day! Patti is late for a very important date! Disneyland is celebrating everyone's birthday this year. I got to ride Space mountain twice today. Poor Danneel got her face blocked for this photograph. Today we started the day off riding the kid rides. Like Snow Whites Scary Adventure, Mr. Toad's Wild Ride, Pinocchio, and Space Mountain... We ate breakfast at the Riverbelle restaurant, and then went over and rode California Screamin', then Toy Story Mania, then Screamin' again twice. 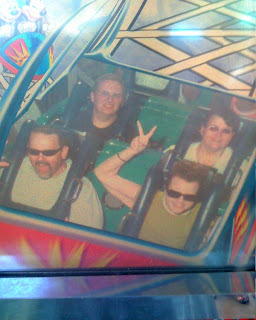 Then we went back to Disneyland and rode the train around the park a couple of times. 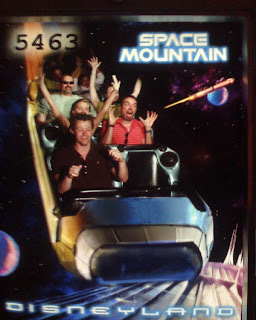 We ate dinner, then Patti and I rode Space Mountain again. About the time they were starting the fireworks, we we getting on Big Thunder Mountain Railroad. After that we called it a night. By the way, sorry about yesterday's tirade on the evil money magnet thing. When Walt Disney built his park, he envisioned a place where people could leave behind the problems of the world, and escape to a world of an easier carefree time in their life... Unless you are a child then it is just pure stimulation (you guys don't have anything to escape yet). 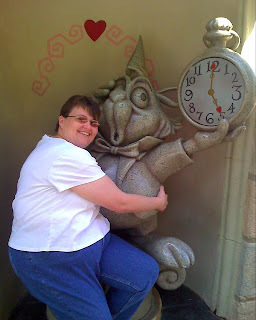 Disneyland does that to a great extent and brings you back to another time, you can leave behind what adult problems you may have, and become a child at heart. I'm hooked, unless they design a patch that will do the same thing. Anyway yesterday... well lets just say I found a soap box, got too stimulated, and well... call it a weak moment. I was cured by a little "hair of the dog that bit me." Besides it's good for the economic stimulus, we all have to do our part for the USA, and I am going to do MY part at Disneyland. Are you 3 the only ones at Disney? I thought your whole fam was going?